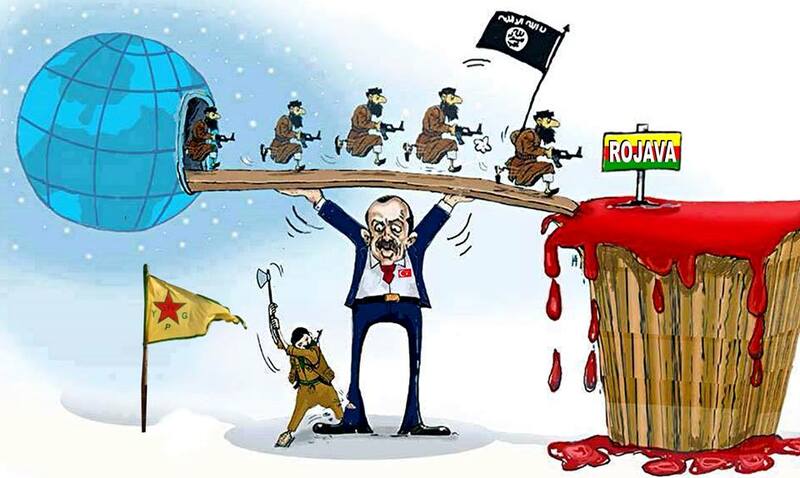 Erdogan is behind the organisation of ISIS, al Nusra and similar Islamist terrorist organisations aiming to conquer all of Kurdistan. Luckily, he could not succeed. Blood-thirsty Erdogan and his terrorist groups have committed horrific crimes. For whatever reasons, the civilised world did not do impose measures against Erdogan for his crimes. Therefore he has reorganised his terrorist groups and has already taken control of several cities in West Kurdistan including Afrîn. The Kurdish nation has the right to react against Erdogan’s attempts to conquer Kobanê according to the universal right of self-defence. If the civilised world allows Erdogan to attach Kobanê, a Kurdish city, Kurds must react against this heinous plan anywhere in the world according to their legal right to self-defence. Such is the position taken by the government of the United States of Kurdistan.